I enjoy reading the threads on here about the vintage refractors from the 50s, 60s and 70s -- the Towas, Tascos, Sears, Mayflowers, Manons, etc. 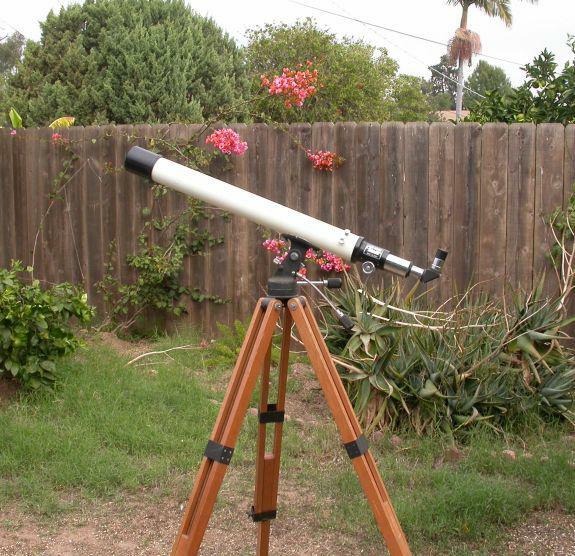 I'm curious though, how these "retro" scopes compare to a modern refractor. Not a fancy $$$$ APO but something along the lines of an Orion Observer 60mm AZ. I guess another way to ask the same question would be, what's today's closest analog to these classic fracs optically, and what are the differences? I'm guessing it's mostly mechanical, right? Plastic focusers, etc.? Decent, modern refractors also have superior optical coatings that allow more light to reach the eye. Gordon, respectfully, modern AR coatings are typically given way more gravitas than they deserve. What matters most is optical quality of the objective. Period. An old doublet refractor objective of long-focus, with a superior figure, will give better images than a modern long-focus objective of "acceptable" figure, even if the modern objective has state-of-the-art coatings. We are talking about less than 15 percent throughput here, in most instances, for all four surfaces of a doublet. In my half-century of experience, fifteen percent brighter image at the eyepiece is nothing, compared to superior resolution. It has been demonstrated that most observers cannot detect even a one-magnitude difference in image brightness, from the center to the edge of the field. The stellar magnitude scale is logarithmic, so, for example, a star that is midway between magnitude 2 and 4 is not magnitude 3, but closer to magnitude 2.8. So a magnitude difference of one is 2.512X brighter. A 15% brightness difference due to coatings is nearly negligible. Coatings play a much more important role in modern multi-element eyepiece design, where there can be 6 or 8 air-to-glass surfaces. Throughput loss would reach 30% if not mitigated by AR coatings. The Japanese post-war refractor industry has the advantage of having been taught the essentials of objective design by their WW2 German allies. It was Zeiss who taught the Japanese how to make essentially perfect refractor objectives, and the export industry after the war profited from it. Most (admittedly, there are exceptions) exporters produced refractors with excellent objectives, given the glass formulations of the day. Having used a 9" Clark, as well as numerous modern refractors, it is my opinion that modern AR coatings are way overblown in their importance to perfect imagery. The closest modern analogues to classic refractors would possibly be something by D&G, though they don't make small aperture objectives. Edmund still sells small-aperture refractor objectives, but the price for one lens would be considered very high in comparision to a used, classic Japanese refractor of similar aperture. I have a '90s model 60 x 900 Tasco. Going up in aperture from there, though, I don't hear much about modern achromats (nor any refractors) with higher focal ratios, say f/15 or more. Modern scopes seem to favor shorter ratios for portability, especially as aperture increases. Newtonians certainly do. OTOH, I hang out here a lot rather than the refractor forum. This means that I'm unfamiliar with modern refractor offerings. So, maybe long focal ratios are still made and I'm just not paying attention. Truth be told, I'd rather find a bargain in an old (abused?) scope with great glass and then hot-rod it instead of spending a fortune for a new, pristine model. Edited by Tenacious, 30 September 2016 - 05:05 PM.  Most topics are re-hashes. Not everyone searches first, let's give recent members a break. +1...in fact I'm trying to do something like this right now--well more like "take two old abused scopes with (hopefully) better than modern glass and make one useable scope rather than try to improve a modern Tasco". I spent the same money on them as I would have on the Tasco...but it's just more fun to reclaim something well-made and should result in a scope with a higher ceiling. Edited by paulymo, 01 October 2016 - 08:40 AM. Definition of "Classic" : " judged over a period of time to be of the highest quality and outstanding of its kind." Admittedly, a number of lower end "classics" are just squeaking into this category due to their now bargain prices but overall, even these lower end classic telescopes are proven superior in build and optical quality over their similarly priced modern counterparts. And at the next level the Sears and Swift, Monolux, SPI and others are such high quality and such a joy to use that there is no comparison except to a much more expensive modern scope. A lot of classics are valued for their nostalgic and collectible value but most just work so well that there is no question of their function and value. I agree with Chuck and Dan's opinions of the merits of the classics. 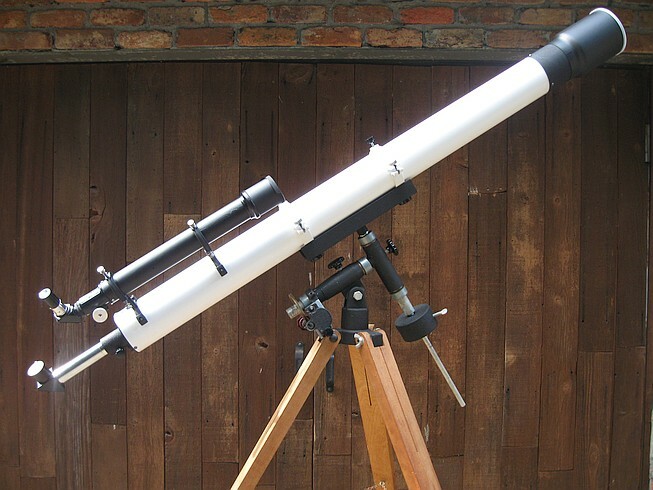 In addition to the optical care that went into the objectives, there is something about the handling and operating of an older quality telescope that brings additional pleasure to the viewing experience. Like driving a classic automobile or fishing with handmade lures. As an additional fun factor, as mentioned above, they can be hot-rodded a bit. For example, I have an older but beautiful Astro-Physics 80mm guide scope that I added a 2 inch OPT focuser to and a 2 inch dielectric diagonal. I of course kept the original parts for restorative purposes. Fantastic glass now with more light throughput and better focus control. I also used to wonder about how good these classics are until I got my 10 TE . I did a comparison of Saturn with it and a modern WO Ed Apo at similar magnification , around 100x and the views were similar if not better with the Tasco! I don't think GSO, Synta, etc. could generate demand for f/15 or f/20 achromatic refractors when there are still so many vintage units available. (The supply :: demand ratio favors us Classic buyers.) If they did introduce a 4" f/15 with a mount & tripod sturdy enough to support it, how could they make a profit when there are still vintage Carton, Edmund, & Unitron models out there? Can you imagine the reviews? Visual observers with even more experience than ole BB already have their bar set high (that's not a criticism). We know how objects are supposed to look through these scopes. The new scope could undercut the average Unitron 152 auction price, but could it perform at that level? I doubt it. Edited by Bomber Bob, 01 October 2016 - 08:25 AM. 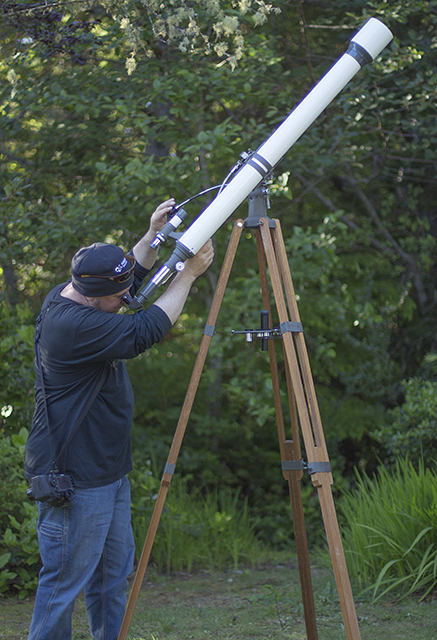 Nothing like gazing through my early 60's 1200mm ATCO at the planets. Best view I've ever had so far. If you limit yourself to 60 mm refractors, then there are no 60 mm long focal length refractors made today that compare to the better examples of the scopes made 40 or 50 years ago both optically and mechanically. The weak points are primarily mechanical in both eras though my experiences with modern 60 mms is that the optics are compromised as well..
My 60 mm F/13.3 is the best 60 mm Achromat I have ever looked through both optically and mechanically. The old scopes typically had nicely made but wobbly mounts. The long focal lengths meant a tall tripod but the tripods were woefully undersized with the expected results. The Asahi-Pentax did not skimp on wood.. The legs are larger than those of the 76 mm scopes of the era. Modern 60 mm like the Observer are entry level scopes, too much plastic. The Orion is probably the best of the bunch, decent optics, decent eyepieces.. The real issue is this: 40 years ago, a 60 mm was more than an entry level scope, it was a serious scope. Today's 60 mm scopes are entry level and there much better entry level scopes that only cost a bit more. The 60 mms are there to hold up the low end. It's on a version of the EQ-1, and I bet it's shaky as all get out with that (relatively) long tube. My EQ-1 carried the Mini (50x600) well, but that was with a very light load. My 60 year old Space Scope 151 would run rings around the Celestron. The 151 wasn't an "entry level" scope back then; however, my Mayflower 814 is toward the low end, and the mechanics are comparable. But I bet the 814's Yamamoto OTA would deliver superior views in a shootout - and for the same or less $$$. It really is a Buyer's Market if you're willing to go vintage. I agree, that Powerseeker 60eq would be one wobbly rig. It doesn't make sense to put an F/15 on that mount, you can't take advantage of the long focal length due to the wobbles. A 60 mm x 700 mm makes more sense, still very good color correction but easier on the mount..
of course there are the vintage AP scopes from the 80's. The views through those sure beat any I seen through vintage Japanese refractors. People need to remember that with inflation figured in the mix, some of those 60 and 76mm scopes would cost over $1000.00 today. The Computerized Generating, Lapping and polishing machines allow for amazing bargains! If the Synta 120 and 150mm Refractors had been made in the late 50's-1970's they would be a very sought after scope. My late 50's Mayflower has amazing optics, it reminds me of my Questar in it handles power well until it simply runs out of light! I had my Questar up to well over 225 X and thought to myself that just can't be true, until I figured it on paper to prove it to myself. So in short.. What Chuck said. You need to use a decent larger aperture scope.. I have an ostensibly perfect 60mm Zeiss and it is not even close to any of my scopes over 80mm on planets. Even my 80's Celestron Polaris C80 shows more detail. Anything larger of good quality and it's game over unless the seeing is truly awful. Don't mean to be a party pooper, but 60mm is 60mm. There are a lot of poor or mediocre optics. Very few reflectors are even in decent collimation. The OP is asking the new house versus old house question. I've owned both, and can argue for/against either purchase decision. New cookie-cutter or old classic? Trouble-free or requiring sweat equity? My first scope recommendation has changed over the years from "buy a 60mm or 80mm refractor" to "buy a 6" or 8" Dobson" in part because the latter have gotten relatively cheap thanks to China. But, my first refractor purchase advice is buy vintage! Why? Because you get more scope for your money. And, vintage lenses are generally superior. And, many of the Japanese imports are integrated systems, where the mount is built to carry the load. Tripods & accessories can be upgraded, and you'll still come out ahead. I observed with my Telementor 2 on the Polaris-Eagle mount last night. Spikes in the ground, damping time under 2 seconds (when it did shake), and the Zeiss optics took me to 210x on Mars, which was barely above the tree tops and sinking fast. The dinky disk was crisp and highly detailed. Yeah, I know, it's a Zeiss; but, my Astro Optical SS151 gets close to that performance level - and for just $100 (scope, mount, & wood case). IOW, small refractors - buy vintage / light buckets - buy new. There's always a faster gun in the West. Of course there's better than what I own out there I'm sure. This is all store bought stuff we are talking about. I stand by my statement though. Even my 59-60 60mm Monolux 910mm or the little Shrine/Manon is anything but mediocre. The sharpness and colors are wonderful. Hardly any CA at all. Blows away all the newer scopes I've ever owned or tried in this same range of quality and price especially the stuff from the late 80's on up so far. I just practically gave away a 90's Celestron 80mm doublet because the views where not even close to my 60's scopes. Vintage Japanese glass just rocks in my eyes. Edited by leveye, 02 October 2016 - 09:47 AM. Yeah, Bob knows where I'm coming from. I enjoy the refurb work but wasn't sure whether there was actually an optical performance advantage to the vinties or if performance takes a back seat to nostalgia for those who observe with them. The closest thing to a "classic refractor" I've ever owned was the 50mm (I think?) Focal brand scope my folks bought me from Kmart back in the 80s. As much as I wish I still had that scope for nostalgia reasons, as a scope, it sucked. Loudly. 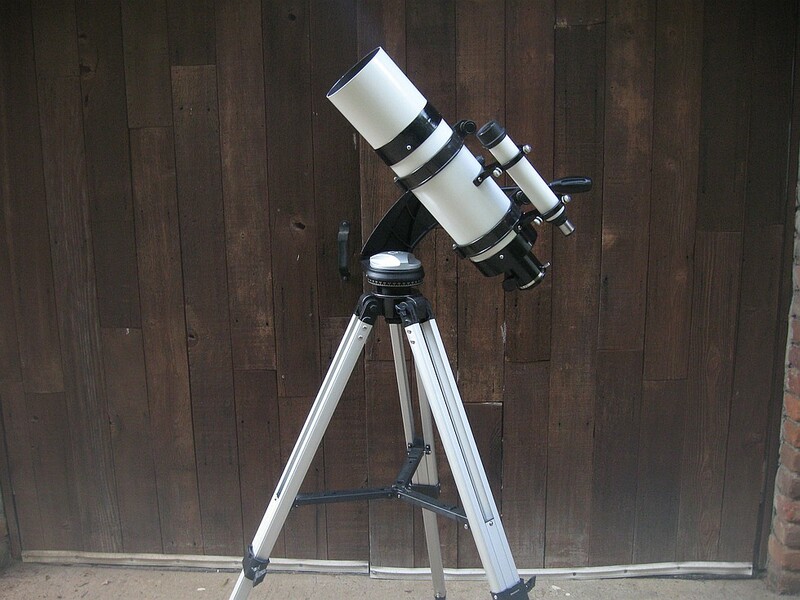 Even the Japanese made 60mm 700mm Tasco doublet from the 70's I owned not long ago was better than the late 90's 80mm Celestron long refractor I sold just 2 days after comparing it with all of these scopes I had imho. Not even close in sharpness. Edited by leveye, 02 October 2016 - 02:56 PM.